This might be a fun way to get your children, teens or even your husband to help around the house! 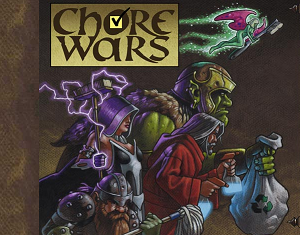 Chore Wars lets you claim experience points for household chores. By getting other people in your house or workplace to sign up to the site, you can assign experience point rewards to individual tasks and chores, and see how quickly each of you levels up. Experience points are tracked both as weekly high-score charts, and as ongoing character sheets - every time you rack up 200XP of chores, your character gains a "level", and their class changes to match the type of chores that they've been doing. ♥ Use it just for a few weeks, to get a sample reading of your household and make sure that everyone's pulling their weight. ♥ Use XP or gold as a target for children - award treats for levelling up, or allow them to 'spend' in-game gold pieces on toys and games in the real world. ♥ Agree to pick out the lowest scorer when the household needs a scapegoat to do a particular, urgent chore (or when you need to pay a takeaway bill). ♥ Keep track of how often a particular chore actually gets done, when it was done last, and who does it the most often. ♥ Use the chore comments as a mini weblog for the household, or for a micro-blog of one particular chore ("making dinner" works quite well, if you want to keep track of what you're eating). ♥ Use the site as a single-chore tea-making roster at work. ♥ Award XP for housekeeping duties on your Internet forum or wiki. Basic accounts are completely free - you can use the site indefinitely without paying anything. The only restrictions on basic accounts are to do with how much historical party data can be stored and explored.